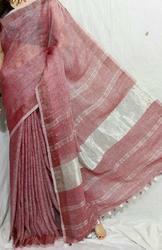 Leading Manufacturer of linen jamdani saree, linen handloom saree, pure handloom linen saree, trendy linen handloom saree, handloom linen saree and fancy linen handloom saree from Kolkata. With immense expertise and experience in this domain, we are highly engaged in offering an excellent collection of THIS Saree. The offered range is highly demanded and appreciated for its best features, like beautiful prints and comfortable fabrics. Being a quality oriented organization; we assure to our customers its flawlessness in terms of quality, design, finish and softness. To add, we are offering these products to our esteemed clients at very cost effective market price. WITH Blouse piece .Blouse Length 1.0 Meter.